Every Tuesday morning, we run a free tea and coffee event for all our senior customers at the store. It's a great social event for them, which they look forward to on a weekly basis, and it's a nice way to give back to the elderly who support our store. We've been running this event for over seven years now, and recently celebrated a 90th birthday party for one of our senior customers. To thank the seniors for loyally supporting our store, we also provide a five percent senior discount every Tuesday. As a result, Tuesday has become one of our busiest weekdays. We’ve been doing it for over seven years now, and the impact is approximately a five percent increase for the day. It's fun. It has become an outing and a shopping experience that the seniors look forward to. It's social. They get to socialize with other seniors. It's free and their shopping is discounted. There is no cost for the coffee, tea, and cake, and they receive five percent off their in-store purchases that day. Returning customers. The senior shoppers are loyal to our store, without question. Increased foot traffic. The seniors bring someone who might be minding them, resulting in double the potential shoppers. Community bonding and brand awareness. I make it a point to have a cuppa with them as often as I can, so I get a chance to bond with the community. We also increase the awareness of the store, owner, and staff. We use our Facebook page to advertise the weekly event and also put it on any flyers we use for our store's local area marketing. We don’t partner with a senior center because sometimes there are too many rules and regulations in place. We set up a table and a few chairs outside our store and have a staff member serve the tea and coffee for free. We place an A Frame sign next to it that says, “Free Seniors Tea/Coffee." At the checkouts, we ask the staff to tell each of the seniors about the program. Whenever I walk through the store, I make an effort to find the senior shoppers and invite them to tea. We chose a day that suited the store, but it is always good to find out when the pensioners receive their pension payment and choose a day after that to increase the likelihood that they will shop after the event. The event runs for about two hours every Tuesday, so it costs us about two hours of adult wages for one staff member, plus the cost of coffee, tea, and cake. At our smaller store, a pensioner’s daughter offered to run it for us, so we give her a store gift card for the service. Set up. Find a suitable area you can use to set up a folding table and six to eight chairs to start with, and purchase a small urn for the hot water. We use disposable cups to keep the cleaning process minimal. Put up signs in-store and tell your senior customers about it. Speak to some of the local senior centers to see if they can bring a group to your shopping center. If that happens, let them choose the most suitable day for them, then use that day for all senior discounts as well as the morning tea and coffee event. Be kind. 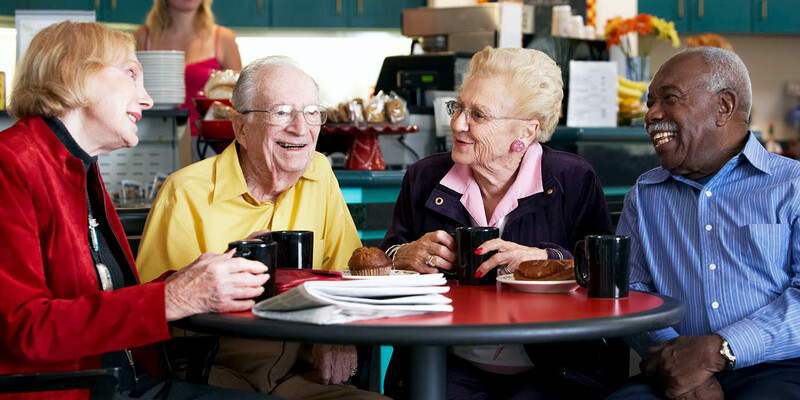 Show some love and compassion to the first set of seniors who sit down for a coffee. Find one of your mature staff members who know some of the senior customers so that they can become the person to run the coffee morning. The owner should be involved as much as they can by attending the events when possible. Note the audience. It’s all about addressing the local community from the youngest to the oldest. Gen Y is a lot more difficult to interact with on a personal level, as they prefer electronic mediums of interaction. Have a best practice of your own? We want to hear it!